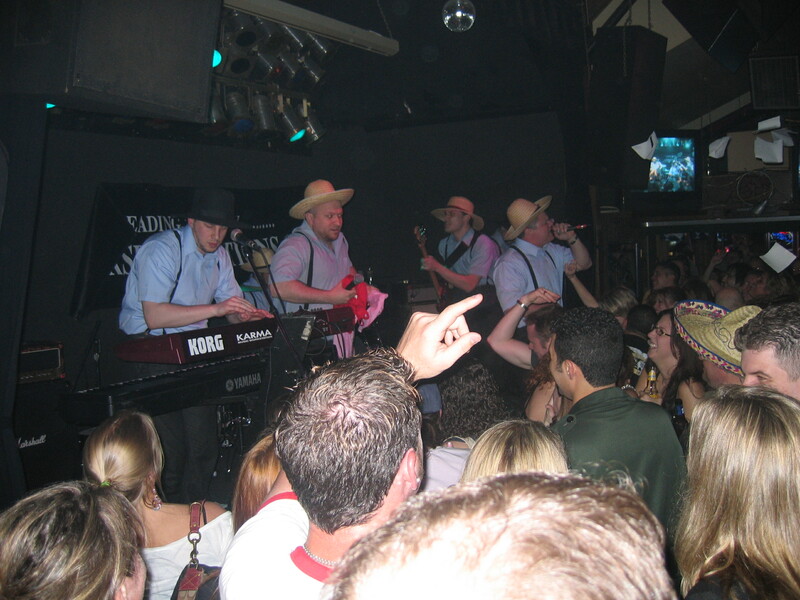 It was 2005 during the annual Spring Bash festival at Bar Anticipation in Belmar when I saw a group of guys dressed like the Amish walking around the mega-club. The crowd was abuzz — an air of confusion, interest and disbelief at this group of sweaty guys in black hats and blue shirts, mingling with the happening crowd like it was just another day at the office. In the middle of the show, the guys were called on stage by the band Dog Voices to perform a couple of songs. I saw hundreds of people in hushed anticipation waiting for the performance to start. By the time the group broke into the legendary Snoop Dogg and Dr. Dre collaboration, the entire bar was on its feet, bouncing to sick flow of a bunch of pale boys from Lancaster, Pa.
On that night, the legend of The Amish Outlaws was born. From there the band of cleverly named musicians — Brother Eazy Ezekiel (bass, vocals), Brother Amos Def (keyboards, banjo, vocals, guitar), Brother Big Daddy Abel (lead vocals, guitar), Brother Hezekiah X (lead vocals), Brother Ishmael L Cool J (guitar) and Brother Jakob The Pipe Layer (drums), have become one of the most popular and in-demand acts not only at the Shore but all over the Northeast. Recently, we sat down with Brother Eazy Ezekiel for a rather offbeat Q&A. 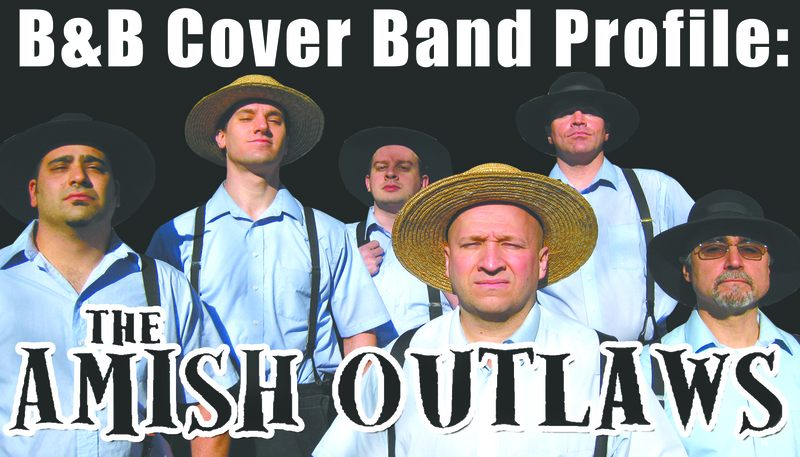 B&B:The biggest question that’s been posed to me as someone who covers the cover bands is: “Are the Amish Outlaws REALLY Amish?” So, are you? Brother Eazy Ezekiel: Three of us were born and raised Amish, yes. We don’t practice the faith and never joined church, but we are still Amish the way you are still Jamaican even if you do not live in Jamaica. Bodkin is a Jamaican last name, right? B&B: Explain how you left the Amish people? The Amish don’t believe in baptism as a child. You make the choice as an adult to be baptized. Before you make the decision either way, you go on Rumspringa and experience the outside world. We got a taste. Then another taste. Then pulled up a chair at the buffet and settled in for a long meal and here we are. B&B: How did you meet the other members of the band? BEE: I grew up with Amos. We met Hez at a vacation park in the Poconos. Hez was in prison with Ishmael in opposing gangs, but they put their differences aside once they got on the outside. Turned out they were both wrongfully incarcerated. What are the chances? Jakob wandered in to a greasy burger place where I was working, looking for directions. I tried three times and he just kept up winding up back there. So after the third time, he just decided to stay. I am horrible at giving directions. BEE: Well, I didn’t just jump right in to the outside world. It was a slow process. When I started Rumspringa I would just go out among the English (non-Amish). To the mall. Walmart. The movies. I acclimated myself before deciding to get an apartment in the area — and then threw caution to the wind and decided to move to New York. Now that was a bit of a culture shock. I don’t live in the city, but pretty close. I think for anyone moving from a rural area to the suburbs though there would be a big adjustment, but on the whole, the transition wasn’t all that difficult. Especially once I discovered black coffee. B&B: What was the inspiration to form a band? BEE: We loved music. We didn’t hear much growing up. Here and there. I heard Sgt. Pepper’s Lonely Hearts Club Band, and it changed my life and dove in head first, and it went from loving it to wanting to play it. Amos took to music like a duck to a junebug. Hez always had a good set of pipes. 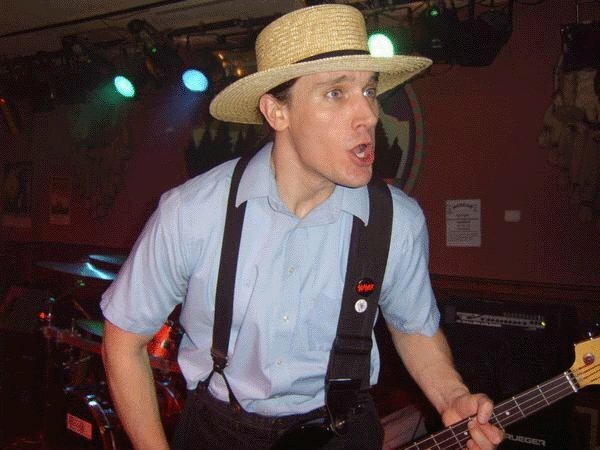 We had played in other bands before but when we met Hez and our original ‘other lead singer,’ Brother McMullen, suddenly “The Amish Outlaws” made sense. Brother McMullen’s actual name is Gerold by the way, but you didn’t hear that from me. B&B: Can you explain how you brought in two non-Amish members into your band. 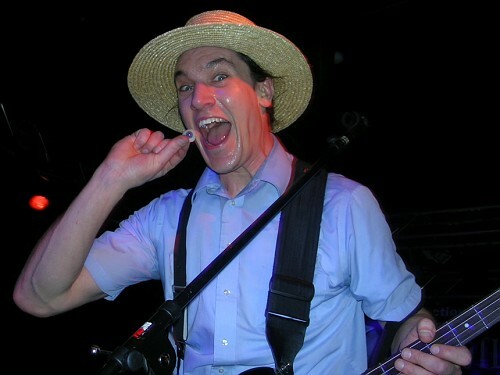 BEE: Because there aren’t many good Amish guitar players. Yngwie [Malmsteen], maybe. But I hear he is only half-Amish. B&B: Why become a cover band? Why not become an original group? BEE: Well, we had played in some original bands before. When we started this band, we did have original songs. Even played one or two out a few times, but the covers were so much fun because of the reaction we got from the crowd. We aren’t in this for any deep artistic reasons. We love playing music and making people smile and laugh. Besides, ever been in an original band? Man, that is a pain in the rear. B&B: How was the band discovered? BEE: Wait. We were discovered? B&B: I can remember one of your first shows being at the 2005 Bar A Spring Bash — do you remember that show? If so, explain that first big night as a band. Can you talk about the initial reaction the band received? BEE: Well, that wasn’t one of our first shows. We played our first show on July 21, 2003 and played a bunch more between then and 2005. That Bar A gig was our first at the Jersey Shore, and kind of a turning point for the band where I guess you could say things started to take off. I do definitely remember that show. At least the first few hours. We walked around the crowd and made friends with people. Then, [Rob] Monte and his band at the time, Dog Voices, were kind enough to let us jump up and play two songs on their gear. We did “Milkshake” by Kelis and “G Thang” by Snoop Dogg and Dr. Dre, and the place just exploded. Not literally, Bar A is still there and intact, but people went nuts. It was exciting. It felt like something big was happening. Turned out it was just gas, though. BEE: Yeah, I am sure we were. You hear chatter. I think when folks see us we are able to convince them that it is not just a gimmick. We sweat WAY too much to be a gimmick band. B&B: Talk about why the band infuses hip-hop, especially ’90s gangsta rap, into sets. BEE: Because we love it. One of the things about growing up Amish is we weren’t raised on a certain type of music. Like the friends I have that grew up English usually grew up listening to one kind of music. You were a rock guy, or a rap guy, or a country guy. Sure, as you got older, your tastes expanded, but it seems like the first kind of music a person latched on to winds up being the real passion. When we got out here we listened to it all. Rap. Rock. Metal. Country. Western. Dance. Funk. So when it came to the kind of music we chose to play, it was what we loved. Rap is in that big mish-mosh. I think a lot of bands figure they can’t play rap stuff, but if you put the time in you can play any kind of music, really. I guess that is our selfish reason for doing it. But, really, it is because it shocks the heck out of people. They don’t expect it, and we love that look of surprise. And it seems most people like rap. And there is something funny about six guys in Amish gear playing hip hop, yeah? B&B: How and why did Big Daddy Abel join the group? Was he also of Amish descent? BEE: He joined it because he experienced a momentary lapse of reason. McMullen retired to focus on family. He made the right decision and has a beautiful family and a calm life. Big Daddy Abel was introduced to us by our friend Cara at a show. We were in the market for a vocalist, and he was one. Then he joined us and became a ‘cover band guy’ and stopped being a vocalist. He fits like one of those square pegs. And no, he is not of Amish descent. He is of Jersey descent. B&B: What are some crazy things that have happened during an Amish Outlaws show? BEE: Huh. We’ve had bras thrown on stage. No kidding. I almost broke my ankle once, but that had nothing to do with the bras. Big Daddy Abel cracked his head on the PA speakers at Seacrets [in Ocean City, Md.] and almost passed out. Hez once did a headspin on carpeting and got rug burn on top of his head. Jakob has been smacked in the face by Hezekiah’s flying hats. Ishmael has drank a lot of gin. Amos did the ‘windmill’ break-dancing move at a show in D.C. and broke the land speed windmill record. I think what might take the cake, not to brag, is that I once put a guy’s glass eye in my mouth. Not that putting a glass eye in your mouth is really something to ever brag about. B&B: Since we’re partial to the Jersey Shore, what’s some of your favorite things about playing the Jersey Shore cover scene. B&B: In that same vein, since you guys play all over, how is different than the other scenes you play? BEE: There is something about the Jersey Shore that other scenes just don’t have. I can’t put my finger on it. Maybe it’s the Jager bombs. Or the … forget it. B&B: What does the future hold for The Amish Outlaws? BEE: Lots of red meat and mileage. And hopefully, people don’t get sick of us. We are working hard to learn new songs and will always break our butts to make sure people have a good time. We hope it is a long future, with lots of shows, and lots of new friends. You guys are the best.